Our flagship! This fin has been developed to fill the needs of the most demanding and dedicated of spearos. The unique shape is to provide maximal thrust and agility both on the surface and underwater. The blade structure is groundbreaking in taking best out of the fibreglass and carbon/kevlar worlds. As the profile of the blade is tapering the needed strength and rigidity in critical parts is created by vacuum processed multilayermixture of resins and other chemicals. This naturally contributes to that extra 'snap' to the blade over the whole lenght, however, the actual 'engine' of this fine tool is its special carbonfibre/kevlar lamination. This superior material gives the fin its unparalleled thrust and resistance to wear and tear compared to traditional fibre fins. 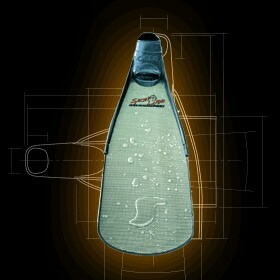 If you are looking for a fin capable of handling all imaginable conditions with remarkable resilience, look no further. Available foot-pockets are OMER Millennium(Mill), OMER Stingray(Stin) and PICASSO Speed(Pica). All spearfishing fins come with a TWO year warranty for materials and craftmanship.